Blood clot. 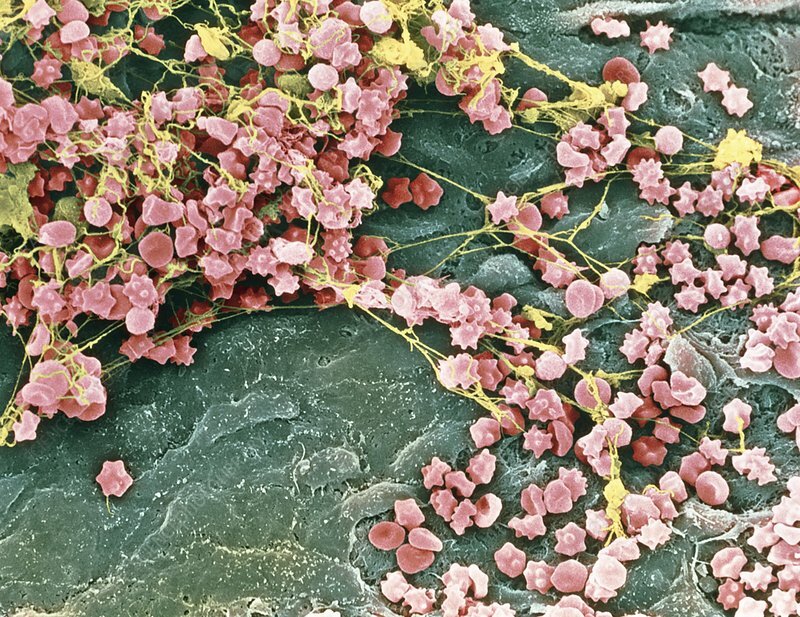 Coloured scanning electron micrograph (SEM) of a human blood clot forming in a blood vessel. The clot consists of fibrin threads (yellow), an insoluble protein. These threads form a mesh which traps blood cells (brown) to prevent bleeding and seal any damage to the blood vessel. Disc-like red blood cells and spiky platelets are seen. Blood clots are triggered by chemicals released by platelet cells in the blood. These chemicals begin a complex series of chemical reactions in the blood which result in fibrin formation. An abnormal clot (thrombus) can occur in intact blood vessels, and is the main cause of heart attack and stroke. Magnification: unknown.